Where seen? Among our favourite seafood, lobsters do exist on our shores but they are usually found in deeper waters and only sometimes seen by divers. During the day, they are usually well hidden among corals. Those seen on the intertidal, were sadly trapped in drift nets. 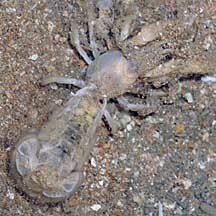 Some relatives such as mud lobsters and ghost shrimps are also common though rarely seen. What are lobsters? Lobsters and their relatives are crustaceans that belong to various Infraorders in the larger Order Decapoda. The Family Palinuridae include some of the lobsters that we eat. There are other lobster-like animals that are not really shrimps. 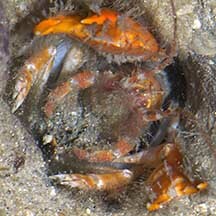 Those more commonly found on our shores include the mud lobsters and ghost shrimps and mud shrimps. 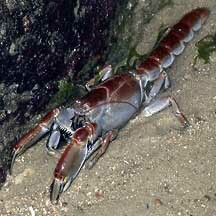 Features: Like shrimps, lobsters and lobster-like crustacea have a long body and broad tail, and long antennae. 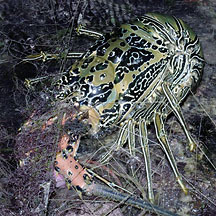 Lobsters have heavy shells, unlike the light flexible exoskeletons of shrimps. Lobsters and lobster-like crustacea have heavier legs and tend to have powerful claws. They don't have swimmeretes (pleopods) like shrimps do. But they can also rapidly move backwards by flexing the abdomen and broad tail. Human uses: Larger lobsters are harvested as seafood everywhere. intertidal, sadly, usually in driftnets. although the burrow is often encountered. but it plays a vital role in our mangroves. from Wee Y.C. and Peter K. L. Ng. 1994. A First Look at Biodiversity in Singapore.